Smart Cities Council | Introducing Smart Cities Project Activator: online portal to scope and fund smart city projects! The Smart Cities Project Activator is a powerful new tool delivered through an online portal that helps cities like yours reach consensus faster, scope projects quickly and win innovative financing for these projects. And, as part of the Smart Cities Council’s proven Readiness Program, it helps you develop truly cross-cutting solutions that deliver actual benefits across your city. Qualified applicants to the 2019 Smart Cities Council Readiness Challenge get free access. What is the Smart Cities Project Activator? The Smart Cities Project Activator — an online portal, is a collaborative resource that helps you tear down silos that separate your departments and job functions. People from across your city can work together in a shared software environment that allows you to improve project collaboration and analysis — all leading to better financeability! 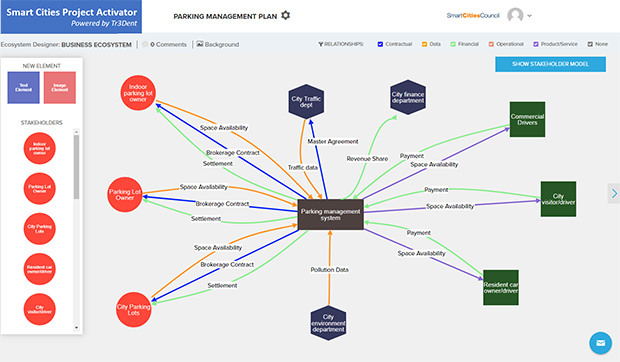 With web-based visual models and dashboards using principles developed in the Council's Readiness Program, you can see the impacts and dependencies across departments and stakeholder groups. These different groups can work together, seeing the results of their shared decisions in real-time, driving consensus up to 30% faster and developing stronger, more cross-cutting solutions. And when the time is right, you can invite solutions providers and investors into your shared project workspace on the web to work with your city to develop innovative financing partnerships. Solutions providers can help ensure that your project is scoped to deliver the results you want — helping to the right solution at the right time. The investment community can also participate in the Smart Cities Project Activator. By having cities and investors work together earlier in the process, innovative financing options can be developed to launch the projects quicker. Participate in a Readiness Challenge. Cities that participate in a Smart Cities Council Readiness Challenge have free access to the tool as part of their application. Next step: Apply for the 2019 Smart Cities Council Readiness Challenge and get on the mailing list so you hear first about new challenges. Express interest. We will also open the Smart Cities Project Activator to cities that want to use the real-time modelling capabilities outside of our challenges. Just let us know you’re interested.